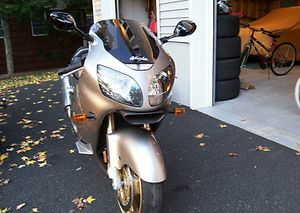 The Kawasaki ZX1200A is a motorcycle produced by Kawasaki from 2000 to 2001. The Kawasaki ZX1200A is a supersport motorcycle made by Kawasaki and more commonly known as the ZX-12R. 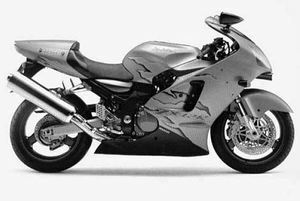 Before the introduction of the ZX-14 (ZZR1400), the ZX-12R was Kawasaki's flagship sport bike and a competitor to Suzuki's Hayabusa. The ZX-12R is a fuel injected (4 x 46 mm throttle bodies) 1200 cc supersport motorcycle, generating around 178 hp at standstill and 190 hp at 300 km/h by virtue of its ram-air system. Handling and braking match the power of the engine resulting in a motorcycle that is docile at low speeds and very easy to handle in heavy traffic, but has strong acceleration and a top speed limited to 186 mph (300 km/h). 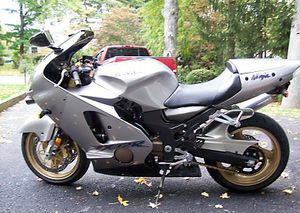 Pre-production models of the ZX-12R revealed a motorcycle that was indeed faster and more powerful than Suzuki's Hayabusa. 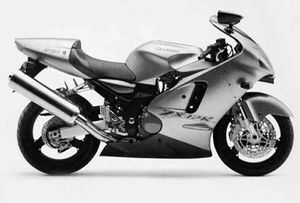 Several notable motorcycle publications tested the pre-production ZX-12R and found it to be superior to the Hayabusa in terms of straight-line performance. In Japan, pre-production tests revealed a top speed near 200 mph. 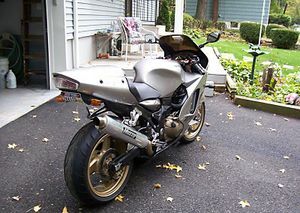 However, the 2000 release of the ZX-12R proved to be somewhat of a disappointment, as the production version of the ZX-12R was delayed for weeks without notice. Many in the industry report that European governments had threatened to ban the ZX-12R altogether due to its top speed and outlandish acceleration statistics. 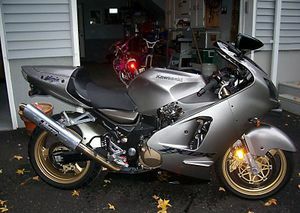 These threats were apparently taken seriously, and Kawasaki released the bike with a slightly de-tuned engine which failed to knock that Hayabusa from its throne (in terms of top speed and acceleration tests). The adjustment was not enough to satisfy those parties concerned with the ZX-12R's performance capabilities. 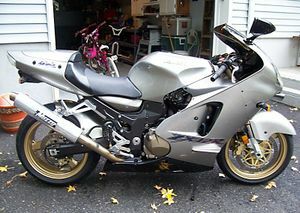 Starting with 2001 models, speed limiters were included to reduce the ZX-12R's top speed to 300km/h. This was due to the fact that governments (mainly in Europe) were concerned with the ongoing pursuit among Japanese manufacturers of ever higher maximum speeds, which were seen as a powerful marketing tool in most markets around the world (despite the unfettered presence in the market place of many cars boasting top speeds close to, or exceeding 200 mph). The manufacturers were told that they could voluntarily limit the speed of their bikes, or there would be a law limiting speeds. Japanese manufacturers agreed on a gentlemen's agreement to limit top speed to 299 km/h (186 mp/h). 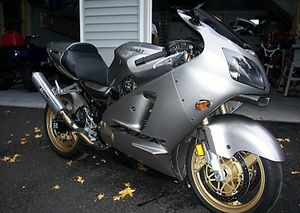 In 2002 the model was slightly updated and the model designation was changed to the ZX1200B. The Kawasaki Ninja ZX-12R was discontinued in 2006 when it was replaced by the Kawasaki ZX14. 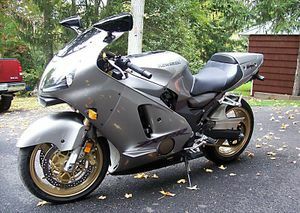 While not nearly as popular in terms of sales as the Suzuki Hayabusa, the ZX-12R enjoys a strong following among its riders and fans. Many sport bike magazines praised the ZX-12R for its overall sportbike performance. 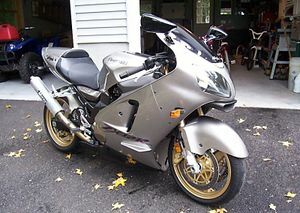 It was designed to be an all-around sportbike in addition to being very fast, unlike the Hayabusa which was designed more for straight line speed. Many magazine comparisons proved the Kawasaki to be the faster and quicker bike in head to head comparisons with the Hayabusa, however it should be noted that these bikes are so close in terms of straight-line performance that many factors could play into which bike was faster on a given day. However, most magazines unanimously felt the ZX-12R was a better "track bike" than the Hayabusa, which is logical given its design.